CCDG welcomes Dr. Merlin Bicking as our May Dinner Lecture Guest Speaker. 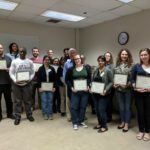 Dr. Bicking has been CCDG’s Liquid Chromatography School instructor for a few years now. 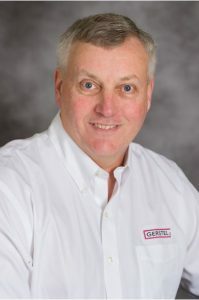 His knowledge and experience have been invaluable in assisting students from a variety of chromatography backgrounds. Science has the power to positively influence the quality of life for people living in developing countries. However, transferring scientific technology and expertise for the benefit of a society requires more than just donating used equipment. Infrastructure such as utilities, facilities, staff, and budgets must be in place to fully generate any meaningful results from the technology. We often take these factors for granted, but in a third world environment many of these items are missing or of poor quality. In addition, their goals, priorities, and perspectives are significantly different from ours, and sometimes our good intentions can make things worse. This presentation will focus on our experiences with ChromAfrica LLC, a consulting and training services company based in Nairobi that we founded in 2009 to provide technical training to local scientists. 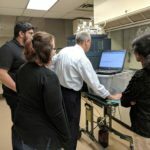 While the initial training events covered chromatographic topics, numerous other sessions have addressed a much wider range of issues, even going beyond laboratory technical training. 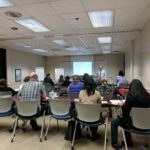 The many challenges that we encountered revealed some fundamental differences in business practices and culture that require a unique approach to both training and business development. There are significant issues facing the region as they try to integrate their economies into the international community and we will discuss how we, as analytical chemists, are helping. Finally, we want to answer two other common questions: 1) what is it like to visit Africa, and 2) did you see any wild animals? We will provide some details about life in East Africa, and, yes, there will be some safari pictures! Dr. Bicking received a BS. in Chemistry from the University of Wisconsin – River Falls and a Ph.D. in Organic-Analytical Chemistry from Iowa State University. 2019’s CCDG open board meeting is here. If you would like to become a board member or simply find out what being a board member is about, this event is for you! Nominations and elections for new board members will take place. This event is open to everyone. When reserving your free seat, please ensure the ticket option selected is for the dinner option of your choice. Get your tickets here! 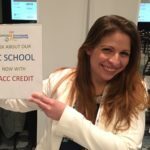 20 hours of AACC ACCENT® Credit will be awarded to the learner after completion of a short survey at the end of the course. Registration Fee is $995 which includes textbook, supplies and lunches. Special Student Registration Fee is $500. Check out the Registration Link on Eventbrite for more details and be sure to follow CCDG on Facebook and LinkedIn for updates! 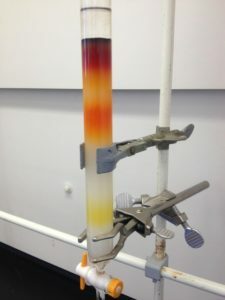 Thermal desorption is an injection technique for gas chromatography wherein the sample is heated to release analytes into the GC carrier gas stream. Different thermal desorption modes and devices can be utilized with a thermal desorber, in order to handle gas, liquid and solid samples. Direct thermal extraction (DTE) is a thermal desorption technique in which a small amount of sample, typically 10-50 mg, is placed in an empty thermal desorption tube. The sample is heated in the thermal desorption unit under a flow of inert gas, in order to release volatile and semi-volatile compounds from the sample. The analytes are trapped and then analyzed by GC/MS. The Gerstel Twister is a PDMS coated stir bar which can be used in headspace or immersion mode to extract analytes from either solid or liquid samples. Thin Film SPME (TF-SPME) devices are a 20 mm x 4.8 mm sheet of carbon mesh coated with DVB/PDMS or CAR/PDMS. They also can be used in headspace or immersion mode. Both Twisters and TF-SPME are analyzed by thermal desorption. Air samples are handled by using thermal desorption tubes packed with a solid sorbent material. Air can be actively pumped through the tube or the sorbent tubes can be used for passive diffusive sampling. The sorbent tubes are analyzed by thermal desorption. This talk will focus on these techniques and show examples of each. Don’t forget, you may renew your membership at the same time as buying your ticket. 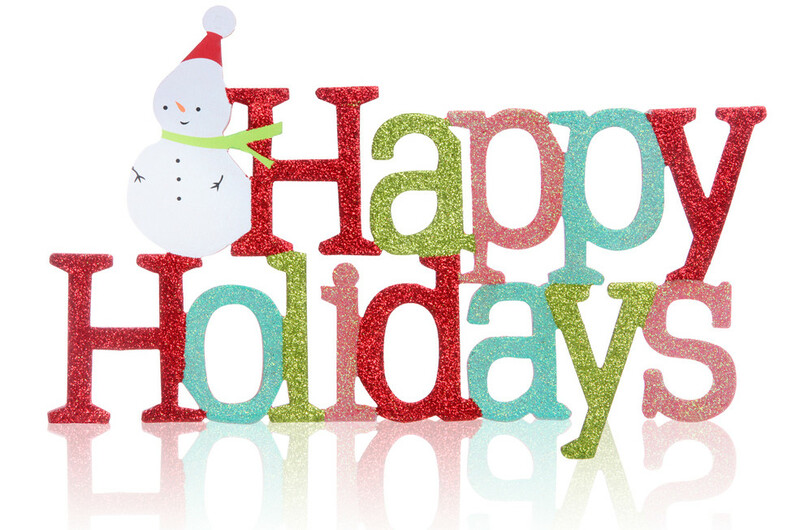 We would like to wish everyone a Happy Holiday season and we look forward to all of our events that are upcoming in the new year! Congratulations to our Young Chromatographer! Thank you all for another wonderful Young Chromatographer dinner meeting! CCDG is proud to host it’s second Young Chromatographer meeting. Established in 2017, the CCDG Young Chromatographer Award is designed to be awarded to a young person who presents their original research at our student dinner meeting. CCDG is committed to promoting an interest in and providing a forum for, the exchange of information in all areas of chromatography. As part of our philanthropy strategy, the group has established this award to encourage young scientists to do research and provide a forum for their presentation. 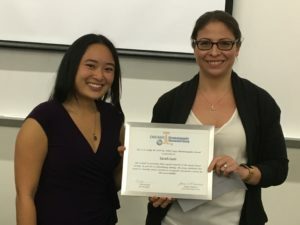 Sarah Lum, Notre Dame graduate student and CCDG 2018 Travel Award Winner! 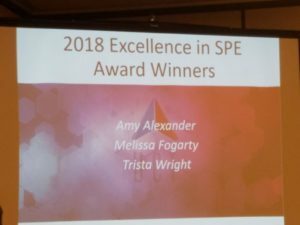 A huge round of applause to our President Amy Alexander for being selected as a 2018 Excellence in SPE Award winner. 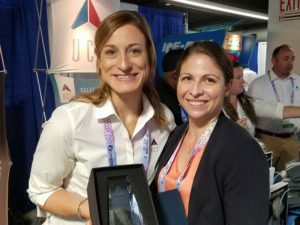 This award is sponsored by United Chemical Technologies (UCT) and was awarded at the Society of Forensic Toxicologists (SOFT) meeting in Minneapolis, MN. The award reflects recent outstanding contributions to the scientific literature in the field of Solid Phase Extractions in Forensic Science. 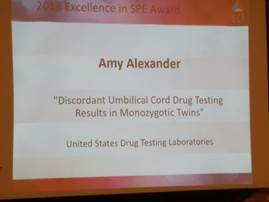 Specifically, UCT is recognizing the article “Discordant Umbilical Cord Drug Testing Results in Monozygotic Twins” where Amy served as the principle author. Abstract: This looks at what options are available when attempting to make the best GC method possible. We will discuss the advantages and disadvantages we may see when making changes to our method and why these changes happen. This includes the differences between carrier gasses, inlet liners, and what kind of influence changes to our column dimensions will have. From this discussion, we will be able to make educated decisions on how best to achieve our desired goals and where to find resources should we have questions. 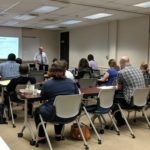 CCDG is excited to announce the 2018 Gas Chromatography school. 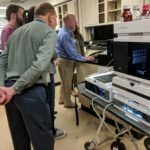 Co-sponsored by Roosevelt University and held on their campus, this course offers a well-designed combination of lecture and hands-on laboratory training. 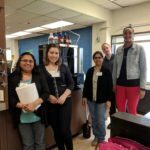 Students gain sufficient theoretical and practical background to perform independent work in gas chromatography. Awarded with 20 credit hours of AACC Continuing Education! Register Here for your seat!